It has taken many calls and a lot of coaxing to get a man we are calling “Mohammed” to meet us. He is originally from Damascus but now plies his trade in the Bekaa valley on the border between Syria and Lebanon. He’s 21 but looks much younger in his T-shirt, skinny jeans and black suede shoes. As we sit in an apartment in central Beirut I have to lean forward to hear the softly spoken young man describe how he began smuggling looted antiquities from Syria. “There’s three friends in Aleppo we deal with, these people move from Aleppo all the way to the border here and pay a taxi driver to sneak it in.” He specialised in smaller items which would be easier to move on – but he says even that has become too risky. “We tried our best to get the items which had most value, earrings, rings, small statues, stone heads,” he says. This is a timely report in that it adds firsthand accounts and reporting of the situation in Syria at present. Whether objects really are going for a million dollars is an open question. As the report notes, the reporters have no way of independently verifying Mohammed’s story. And the report offers much needed clarity to the overclaiming made by some about the extent to which the Islamic State is profiting from illicit antiquities trade. One thing to consider. The UN Resolution on the restriction of funding the Islamic State (which Rick St. Hilaire describes here) may not do what heritage advocates want on its face. It may not take the drastic measures against the trade some may think necessary. But when the UN acts it sends a powerful signal. At the very least it prompts editors and reporters to look into the issue. 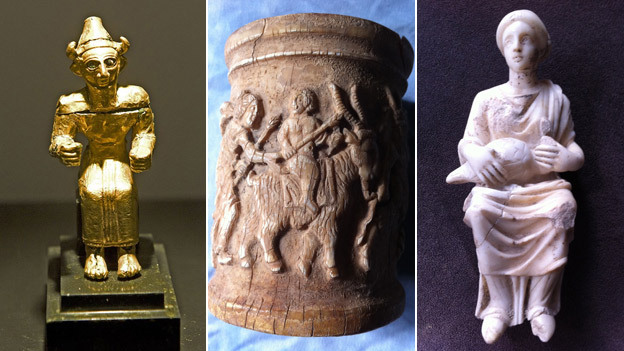 And as a proud line of excellent investigative journalists have shown, investigating the antiquities trade makes for fascinating stories, and even offers surprising insights into how pervasive illicit material has been in the past. The task of heritage advocates is to use this moment to advocate for effective change. These are the moments that present opportunity to effect real and lasting change. The difficulty of course is that there are very different accounts of what can and should be done. And if that gap doesn’t close, we are likely left with more looting and loss. Simon Cox BBC & Lebanon, The men who smuggle the loot that funds IS, BBC News (2015), http://www.bbc.com/news/magazine-31485439. Obviously, the artifacts illustrated and discussed in this report have been interdicted by local authorities, as they should be. More of that is needed. Hopefully, the looters and those proven to be knowingly complicit in their crimes were or will be apprehended and prosecuted. However, all too often, the penalty in a source country for being involved in archaeological looting is far less than the penalties sought by U.S. prosecutors for innocently acquiring an object that may or may not have been looted–no proof or knowledge whatever, beyond supposition. Looting must be stopped, and private collectors should be enlisted and cooperative in that effort, but the vilification, accusation and spurious condemnation of private collecting simply because it’s the easiest face to find is unfair, unconstitutional and irrational.